Religious messages in public service announcements about the dangers of alcohol aren’t more effective, according to research in Palestine. Saleem Alhabash, an assistant professor in Michigan State University’s department of advertising and public relations, tested the approach on a group of students in his native Palestine. To his surprise, his team found that adding a verse from the Koran to the message did not discourage viewers from drinking, considering drinking, or urging others to drink. “Contrary to popular or stereotypical belief, adding religious rhetoric to a health message is not going to work in this particular context,” Alhabash says. 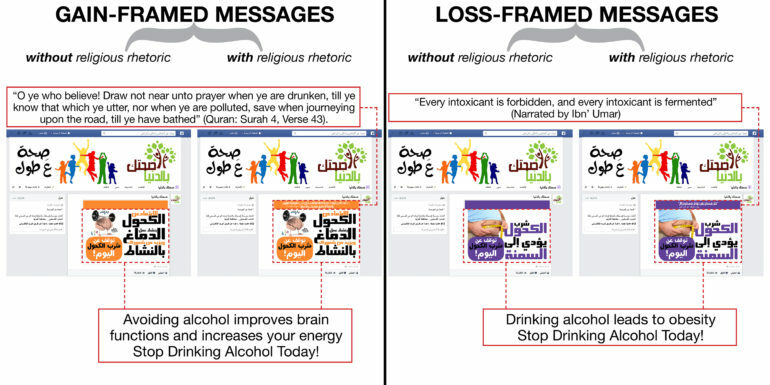 This is how the project worked: Participants were shown two different anti-alcohol PSAs on Facebook, one with a religious message attached, one without. After viewing the messages they were asked if they felt inclined to warn others about the dangers of alcohol or to participate in anti-alcohol campaigns. “What we found is where there is religious rhetoric, people do not want to do this as much as those who are exposed to the same exact message, only without the religious message,” Alhabash says. Why does this happen? Alhabash says it may have to do with something called psychological reactance. That is, when someone tells you not to do something, it makes you want to do it all the more, as if someone is trying to restrict your freedom. In advertising, and in particular in health communications, there are two kinds of messages—gain-framed and loss-framed. Gain-framed focuses on what a person will get if he or she adopts the behavior that is being touted. Loss-framed is the opposite—what will you lose if you adopt that behavior? This research, Alhabash says, reinforces the notion that gain-framed messages tend to work better than loss-framed. “It is worthwhile for advertisers and marketers in that part of the world, especially in the social and health domains, to realize that gain-framed messages are more effective,” he says. The study appears in the Journal of Religion and Health.